Come Join Us For Regular Classes! As you may have heard, Hanshi Kennedy is recovering from a serious medical condition. During this time, Lenexa Karate will continue to hold regular classes (except for Friday, which will be cancelled until further notice), all taught by experienced instructors. Please come join us for regular workouts! 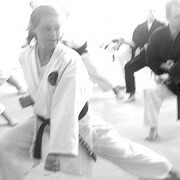 And please be sure to keep Hanshi Kennedy in your prayers for a speedy recovery! In combat, as well as life in general, good timing is essential. If the warrior acts too soon or too late he may be injured or killed. In civilian life, success is totally dependent on the timing of all energy in relationship to opportunities. A skilled fighter is one that can fill the gaps of his opponent’s defense with his own strikes. Those strikes are a summation of mind, body and spirit and delivered to a specific target at a specific time. This is easily demonstrated by an advance karate-ka when they slide across the floor and execute a technique. Each detail has been integrated into the process to create maximum efficiency with minimum effort. Being “on time” is a universal law. By totally concentrating on one thing at a time, and putting all our resources to bear on that task, we are able to produce the most effect results with the use of minimal amounts of energy. If all things are equal, the side that is the most unified and has the best timing will win. This concept is also true when applied to personal success training. The sub-conscious can only focus on one thing at a time, either yes or no. By concentrating on positive forward-thinking goals, negative thoughts can’t penetrate your defense. The law of concentration dictates that what ever we concentrate on grows in our mind and in our experience. 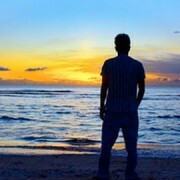 The modern warrior is constantly thinking strategy and tactics in all areas of his or her life. By always seeing options and focusing on positive outcomes, the modern karate-ka is being proactive by developing a winning attitude no matter what the situation. Failure is not an option. We have all heard that we are what we eat. Well, we are what we think as well. By surrounding yourself with positive and successful people, you will begin to think like a winner. If you concentrate on good and healthy things, those things tend to be everywhere. Once you start focusing your mind on winning strategies, opportunities will present themselves more and more. Successful strategies, whether you are talking about combat or in your personal lives, are predictable. If you adopt the strategies and tactics of other successful people, the odds are that you too will be successful in what ever your endeavors may be. Honor never grows old, and honor rejoices the heart of age. It does so because honor is, finally, about defending those noble and worthy things that deserve defending, even if it comes at a high cost. In our time, that may mean social disapproval, public scorn, hardship, persecution, or as always,even death itself. The question remains: What is worth defending? What is worth dying for? What is worth living for? – William J. Bennett – in a lecture to the United States Naval Academy November 24, 1997. The civilian lives in a world that edifies mediocrity. He spends his time playing computer games and when he looses, he just hits replay to try again. He watches TV where the person dies and next week guess what, he is back on the screen again. Instead of taking personal responsibility, he looks to blame others, society or the government for his problems. He constantly strives to increase his abilities and his understanding of the obstacles around him. He believes there is truth to the statement that you are either getting better or your getting worse all the time, and therefore works everyday to improve mentally, physically and spiritually. This concept is not trying to be better than someone else, only that you are improving a little everyday. Kaizen is the Japanese word for constant and never ending improvement. In our quest for black belt excellence, there is no time off. This is a 24/7 endeavor. If you witness senior students and instructors they are always working on improving their mind, body and spirit. Winners feel they are destined for success and are constantly trying to grow and prepare for that goal. Successful people constantly read and listen to positive and inspirational books and tapes. They know that by reading 30 minutes everyday, within a few years they will be in the top 10% of their chosen field. In the dojo, they give it all they have every class, forging their spirit and attitude. The Chinese say that a journey of 1000 miles begins with one step. Kaizen is all about making that step towards improvement, everyday – in every way. Conditioning? I thought this was karate class! When I began learning karate I didn’t understand why we did things like push-ups and crunches. Wasn’t this karate class? Shouldn’t the whole workout consist of karate moves? I didn’t get it! I knew my fitness was poor, but really – how much physical fitness could it take to do front chokes? Or that single kata we were learning? Well, time passed. The more familiar we became with the moves, the more material we learned and the more difficult that material was. Classes moved faster because we had more things to cover in that hour. Renshi introduced circuits; I hated them! (Took awhile to change my mind on those. Jump over to Circuit Convert!) Naturally our fitness improved, but it still took quite awhile for me to understand why it was important. Yes, I know – I’m slow sometimes. What did I figure out? Kick after kick after kick on the bags? Conditioning. Stamina to stay on the floor for all the kata? Conditioning. It takes strength, speed and stamina to practice karate correctly. The more tired you are, the messier your karate will be. In order to get the most out of classes, conditioning is vital. That’s not to say you need to be an Olympic-caliber athlete; it would help, but I don’t know anyone who’s at that level. If you’re not in great condition, don’t stress about it. Do what you can, and make it a goal to improve your conditioning from week to week. Break a sweat in class! Work hard so when you walk off the mat, you know you’ve done your best. Two hours a week in class is not enough if you’re trying to ramp up. On non-class days, work on your kata and basics, walk, swim, paddleboard, bike, lift weights, do aerobics or ballet. It doesn’t matter what you do – but do something! The effort you put forth now will pay off in the long run. When I only had a couple of self-defense sets and a few kata to work on, conditioning didn’t seem very important. Now I’m working on 9 self-defense sets and 14 kata, and I get it! Conditioning is vital to executing moves with power and grace. I came across this story, yet I’ve heard variations of it before. It is a good reminder to us all as we set our goals for 2015. Enjoy. A professor stood before his philosophy class and had some items in front of him. When the class began, he wordlessly picked up a very large and empty mayonnaise jar and proceeded to fill it with large rocks. He then asked the students if the jar was full. They agreed that it was. The professor then picked up a box of pebbles and poured them into the jar. He shook the jar lightly. The pebbles rolled into the open areas between the rocks. He then asked the students again if the jar was full. They agreed it was.The professor next picked up a box of sand and poured it into the jar. Of course, the sand filled up everything else. He asked once more if the jar was full. The students responded with a unanimous ‘yes.’The professor then produced two Beers from under the table and poured the entire contents into the jar effectively filling the empty space between the sand.The students laughed..
‘Now,’ said the professor as the laughter subsided, ‘I want you to recognize that this jar represents your life. The large rocks are the important things — your family, your children, your health, your friends and your favorite passions — and if everything else was lost and only they remained, your life would still be full. The pebbles are the other things that matter like your job, your house and your car. The sand is everything else — the small stuff. 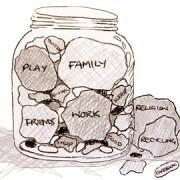 ‘If you put the sand into the jar first,’ he continued, ‘there is no room for the pebbles or the rocks. The same goes for life. Take care of the large rocks first — the things that really matter. Set your priorities. The rest is just sand.